Meat-and-Potatoes-Guy mentioned yesterday that we needed to figure out our Labor Day plans. 1.) That slight heartache in watching the last breezy days of summer slip your fingers? It never really goes away, even after your back-to-school days are long over. 2.) Is there some way (and how?) to bottle that easy, upbeat, carefree summer attitude, even as the cold, dark, slush- and snow-filled days begin to descend? 3.) I’d better make these last few summer dishes amazing and filled with fresh summer flavors and produce – before it’s too late! So I decided to make some very summery and festive-feeling chipotle crab cakes with avocado mango salsa. The flavorful crab cakes make the most of fresh summertime crabmeat. And the salsa is fresh and bright, with avocado, corn, mango, and cilantro. The chipotle peppers bring a nice smoky spiciness, and the mango brings some ripe contrasting sweetness. I used frozen corn and frozen chopped mango to make this an easy recipe that can be prepared in under 30 minutes, but fresh corn and mango make this dish even better! Thaw the corn and mango (just toss in the microwave for a minute). Then dice up the mango into bite-sized cubes. Grab a clove of small garlic, place your knife flat over it, and smash down, breaking apart the skin so it’s easy to remove. Then run your knife through the garlic in every direction, mincing it up. Measure about 1/2 teaspoon of the minced garlic to use in this recipe. Squeeze all the juice from one lime. You don’t need a special citrus juicer, just rotate a fork through the fruit to get all the juice out. Cut a handful of leaves from a bunch of fresh cilantro. Pile them up and then run your knife through the pile, chopping up the cilantro. Next, grab an avocado and cut it in half lengthwise. You’ll feel a large pit in the center, just cut around it. To dice the avocado, cut thin slices lengthwise, being careful not to cut through to the skin. Then slice in the opposite direction, forming a grid pattern. Use the spoon to scoop out the diced avocado. Toss everything (the mango, corn, garlic, lime juice, cilantro and avocado) into a bowl, and season with a pinch of salt and pepper. Then stir until everything is well combined. Next, prepare the crab cakes. 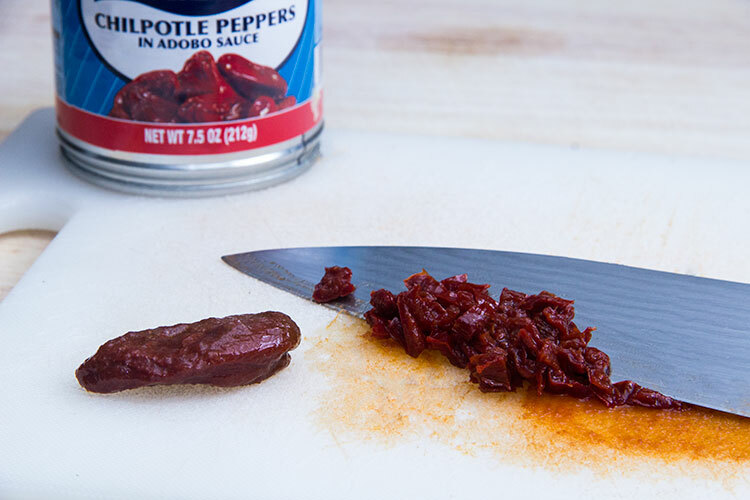 Grab a small chipotle pepper in adobo. Here’s what it looks like – find a small can like this one in the international foods aisle. Chipotles in adobo add a rich, smoky, spicy flavor to the crab cakes. Slice the pepper open, then use your knife to scrape out all the seeds and discard them (the seeds are incredibly spicy – too spicy)! Cut very thin strips of the pepper, then run your knife in the opposite direction, finely dicing the pepper. I used one small chipotle pepper in this recipe for mild heat. If you love a lot of spice, try two small (or one large) pepper(s). Grab some fresh, cooked lump crabmeat and toss it into a mixing bowl. Add the diced chipotle pepper, an egg, and a bit of garlic powder and paprika. Also add a small amount of whole wheat breadcrumbs. Season with a pinch of salt and pepper, and stir until everything is well combined. Then grab large handfuls of the crabmeat mixture, forming round, half-inch-thick patties. Heat a bit of olive oil in a large sauté pan over medium-high heat. Place the cakes in the sauté pan so that there is plenty of space between each one, then just let them sit and cook (without flipping or moving them) for several minutes. You’ll soon notice that the bottom edges begin to turn golden – that’s your sign that it’s time to flip the cakes with a spatula. They should be nicely, lightly browned. That golden crust is delicious, but it also helps hold the cakes together, making them easy to flip. Let them cook a few more minutes on the second side. Then top each crab cake with spoonfuls of the avocado-mango salsa. With the spices and smoky chipotle pepper, these crispy crab cakes are addictive. The salsa adds so many fresh, contrasting flavors – bright and fresh lime and cilantro, creamy and rich avocado, and sweet mango. And it’s that contrast of spicy heat, sweetness, creamy richness, and bright citrus that makes these crab cakes bold, unique, and special. The ideal dish to savor the fresh flavors of summer … while you still can! To make the avocado-mango salsa, add the following to a large bowl: the diced avocado, diced mango, corn, lime juice, chopped cilantro, and minced garlic. Season with a pinch of salt and pepper, and stir until well combined. To make the crab cakes, add the following to a mixing bowl: the crabmeat, egg, breadcrumbs, diced chipotle pepper, garlic powder, and paprika. Season with a pinch of salt and pepper, and stir until mixture is well combined. Shape handfuls of the crabmeat mixture into four, round, half-inch thick patties. Heat the olive oil in a large sauté pan over medium-high heat. Cook the crab cakes until edges begin to look golden, about 4-5 minutes. Flip and cook the the other side, about 3-5 minutes more. Top each crab cake with spoonfuls of avocado-mango salsa, and serve. I think these are the nicest looking crab cakes I’ve ever seen. This looks and sounds delicious! And your photos are stunning! Love the sound of this avocado mango salsa! These fresh, summer flavors sound wonderful! your eye for color composition is incredible, i could totally learn a thing or two just from this post, so beautiful. That salsa is the perfect topper for crab cakes! These look fantastic. And I know, Labor Day, whew. I really don’t want summer to leave me! Summer’s my favorite, both for hanging, and for eating, especially with dishes like this. Uggghhh…your styling! Every single time!! It’s like I opened up a magazine every time I look at your blog. And these crab cakes? I’ll take 7. Absolutely stunning. I’m in love with this. Thanks for sharing! oh man those look good. I don’t think I’ve ever made crab cakes at home before! I adore crabcakes and I adore mango salsa but I have never had them combined in one dish.